Boat descriptionCoco de Mer is a 2006 Privilege 495 catamaran – 49 feet long, 72.5 feet tall, and about 24 feet wide. She sleeps 6 comfortably with 4 staterooms and 4 heads (one head used only for storage). She offers lots of living space with a galley-down design. 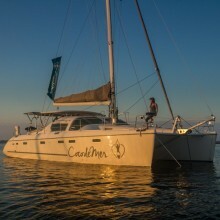 We choose this boat for her durability on the ocean, livability, and speed on the water. Having sailed from Charleston, SC through the Caribbean, Panama Canal and across the Pacific over the past two years she has proven herself to handle well on the open ocean. Coco de Mer has even completed Atlantic ocean passages before we took ownership. We have 5 sails – mainsail, Genoa, jib, storm sail, and gennaker – to sail in a variety of wind conditions; as well as 2 diesel Yanmar engines. We use iSailor and SealQ for navigation. We are well-equipped with a 6 person life raft, EPIRB, AIS in the PFD's (crew required to wear during all night watches and in foul weather). Our ditch bags contain a variety of food, water, and other survival items (a full list available upon request).